【Why don't you?? ?】ビルみたいに生きてみたらどう？Why Don't You... Try to Live Like Bill? Why Don't You... Try to Live Like Bill? "I let the street speak to me." "If you don’t take money, they can’t tell you what to do, kid. That’s the key to the whole thing." "Money is the cheapest thing. Freedom is the most expensive thing." "I don’t think you could do away with it (fashion). It would be like doing away with civilization." "My dear, it’s not work, it’s pleasure." "I don’t work, I only know how to have fun everyday." Why don't you try to live like Bill? First of all, you may be thinking, who is Bill, right? 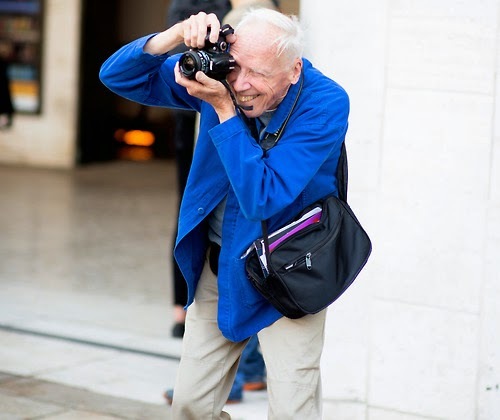 Have you heard of Bill Cunningham? 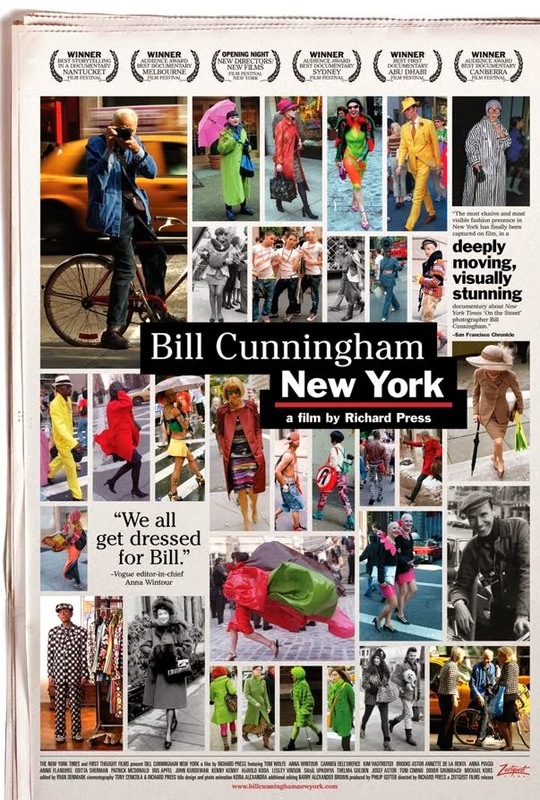 He is an 80 year old photographer who's been taking photographs of the NY street fashion for over 40 years. I was really surprised about how watching a documentary about an old photographer made me cry! It was not a kid-stuff fashion film as I expected. Try to get hold of it. "I let the street speak to me". "If you don’t take money, they can’t tell you what to do, kid. That’s the key to the whole thing". "Money is the cheapest thing. Freedom is the most expensive thing". "I don’t think you could do away with it (fashion). It would be like doing away with civilization". "My dear, it’s not work, it’s pleasure". "I don’t work, I only know how to have fun everyday". This guy lives in a very simple place and eats junk food, worse than Subway. He wears something that looks like a raincoat, the kind they sell in Walmart America and a blue blouson which he wears all the time; its tears are patched together with tape. Every morning he leaves his shabby little apartment near Carnegie Hall and sails out jauntily on his bicycle to the streets of NY. This is different than commuting; there's energy and a spark to his daily morning appearance. Then he focuses his lens on people who walk the streets, wearing beautiful, radical fashion, at the moment they cut through the crowd. Maybe the words "dolled up women" have a nasty sound to them, but what he really likes is taking pictures of women who are dressed like a bird from a southern country. He loves his work so much he says that he has never been in love in his entire life. If he had time for love, he'd rather get to the streets and cut up some more beautiful moments from life. So, what made me cry, you ask. Well, his face as he takes pictures of people in beautiful outfits on the street (which for him is an everyday event). His face is so innocent, so child-like and happy. He laughs so much. How many years has he been doing this? Normally you would get tired of something, get used to it and get a little lazy, right? Moreover, he doesn't have anything else in life other than his work??? He doesn't have a family, he doesn't have the NY luxury lifestyle and he doesn't aspire to any of that. Apparently he did work in the past for a large fashion magazine, but he wouldn't take a penny because he didn't want to have the freedom of his creation snatched away for money. Of course, at some stage along the way he had a column in the NY Times and there are no fashion people whom he doesn't know, so had he thought of getting wealthy, it was within his reach. Don't you think that's lovely? However, as far as he is concerned, no wealth compares to the excitement that he gets from shooting the funny, fabulous fashion on the streets of NY. I have said this over and over in a few of my posts, that the majority of values we are taught, for playing along with the world and with other people, are not our own values. You notice this probably only after you've experienced many things (especially me, whose spirit is a little childish). Take me for example, I saw an ad for first class in a magazine and thought it would be lovely to fly first class. My boyfriend got me tickets (never mind that finally it turned out to be a bigger headache than economy). I thought that I'd like to live in a house with a pool and a maid, then realized that dream in a country where the cost of living is a 1/3 of that of Japan, but the excitement lasted only in the beginning. After a week, it became scenery. In that life, the thing that excited me the most was a $1 porridge I bought at a street stall. I think a life of luxury and beauty is nice, but it should never be your goal. Ads in magazine lionize these things, but that's because it brings them money. If you make that your goal, then eventually even if you achieve it, under the business value that that world produces, you will not be able to achieve a sense of satisfaction and you will end up with a fruitless act without results. The same goes for your profession. Everybody's after profession x so I tried it as well, but it wasn't for me... That happens often, doesn't it? What makes you the happiest? If you look at Bill, you will know. A life work, that enables you to feel that excitement every day, A life's work that makes even women unnecessary (love doesn't even become desert). When you have that, you're the happiest. holding on to your own personal values, that is what leads this man into the whirlpool of his life's happiness. It doesn't necessarily have to be a photographer and it doesn't necessarily have to be on the street. For someone else it might be a flower shop, or a teacher, or an engineer, or a captain of a boat. I'm saying, go and find the thing that is just yours. If this article moved anything even slightly within you, then go watch that movie. If your tears roll down the way mine did, then how about living like Bill? This is the director's interview. Q: What do you think you've learnt from knowing Bill? A: That it's important to carry out whatever it is that you like doing. It's important to think that what you are doing is somehow useful to others. It's important to devote yourself to that thing, but at the same time it is extremely important that it is something you can really enjoy doing. If you can't enjoy what you're doing then there's no need to do it. Everybody should wake up in the morning, go do what they like doing and go through life that way. That is what I learned the most, making this film. But I can't pursue that in the same purity as Bill does (laugh). Q: However, there's one thing that disturbed me. Isn't Bill lonely? Is he really happy without any friends? Looking at him from the side, do you think he is really happy? A: I think Bill is really happy. He chose this way of life in order to make himself happy and created his life that way. Of course, when you make choices like that, there are sacrifices you have to make. But I think that is the same in every kind of life. In order to make one choice, you lose something. He decided himself to live his life this way and he survives it. This for him is happiness. I think you will understand if you watch this film, but his face lights up with a smile when he takes pictures on the street. That smiling face is nothing but the real thing (laugh).